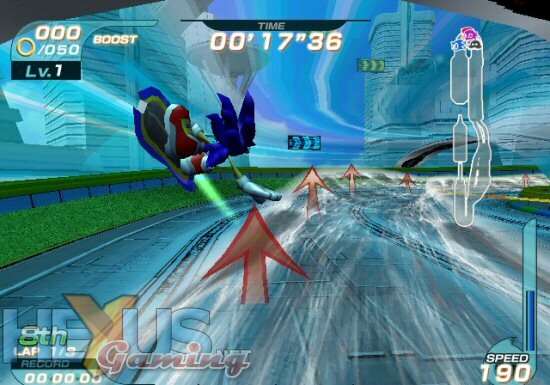 This game is different from other sonic games because instead of running at break neck speeds your riding a hover board,bike,or some other thing. The game has many modes to chose from there's a story mode, time trial mode,mission mode,battle mode,and free race mode. Story mode has you go though 10 different tracks, five for the sonic team and five for the jet team. The sonic team of course features sonic, tail's,and knuckles while the jet team features jet,wave,and storm a group of treasure hunters.There is also a lot of other characters that will be in the game as well. In the begging the only choice you can pick in story mode is the sonic team witch has you go though 5 tracks and stop eggman in the 6th track called Babylonian garden. Once you beat the 6th track you unlock the Jet team where you play as jet,wave,and storm in different tracks.The ending of the story is when you defeat a ghost that protects the Babylonian secret.Witch is a secret to you to. Time trial mode is just that it is where you race by your self for the fastest time you can get.You can race on all of the, i believe 12 tracks for the fastest time.It does make your heart warm when you beat that time you have been wanting to beat for weeks. 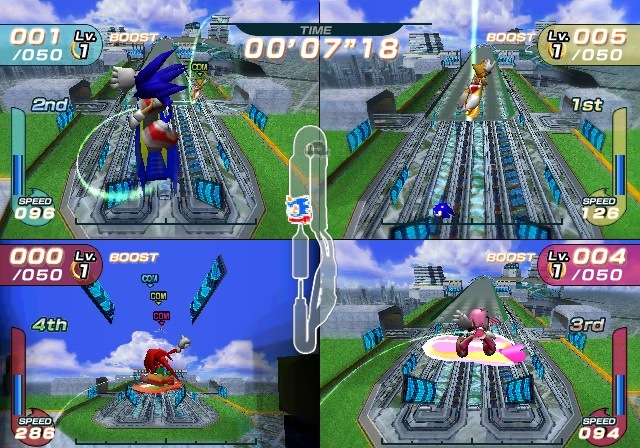 Battle mode is where you and up to 4 people race at the same time.The other thing is battle where you and up to 4 other people try to get the most points at the end of the time limit or no time limit. I remember playing this mode for hours me and my cousin played it for 2 hours and neither of us lost. Free race is where you just pick a track and race if you go to setting's you can change how may laps and other things there are. I once had the lap thing set for 46 laps and it took me a hour and a half at least to finish it. I won i lapped the opponents like 10 times at least XD. Mission mode is where you complete certain missions with certain charterers in a certain amount of time. The mission's may be collect junk,collect a certain amount of rings,do a certain number of tricks,and smash car's. I have played this and it's kinda fun. There is also a shop where you use rings you collect in the races to buy new rides. There are alot of other characters you can use like Shadow,Amy,and even eggman's bots. This game was alot of fun i have played this game for a near 100 hours and i can say this is a good sonic game. The story is good kinda sloppish but nice all the same. One thing that troubles me is the lack of tracks in the game. This game is still worth getting if you haven't played it already. Riders = Worst Sonic games ever. Worse than Sonic 06. Garchomp wrote: Riders = Worst Sonic games ever. Worse than Sonic 06. I have the PS2 version. Does this really deserve a 8!? Retro your being a little to generous... lol!